Other media give their staff time off at Christmas. That’s why you see so many year in review, top ten this and best moments that pieces. They are written in advance. That gives the writers time to do something else. There is a moment in this talk when the value of slowness in urbanity gets mentioned. But he is delivering his talk against the clock and it whizzes by. One of the best lessons I have learned in recent years is the value of doing less but doing it better. Transportation experts are obsessed with speed. But urbanists have learned the value of slow. The best thing to put in a street is a chair with a table. Better is lots of them. Take time to enjoy the holidays. I get a lot of email – and some of it is press releases from organizations that want coverage in this blog. Most do not get more than a cursory glance, since they simply do not have anything to do with what this blog is concerned about. The press release inserted below caught my attention – and held it – and I started clicking on the links. As I think most of you will be aware I do travel quite a bit, and a lot of that is by air, and I have been also somewhat critical of the opportunities to offset that carbon. Indeed, one program that was actually promoted by Air Canada was for a scheme which said it was about planting trees – but in reality was more to do with cutting them down first. On my perusal of the project described below and its association with a Vancouver based organisation, I decided to use them to offset my recent trip to Los Cabos. I do not think of this as some have described it as purchasing papal indulgences for sins. This project does seem to be well designed and worthwhile – but that does not mean I am telling you what to do. You must make up your own mind. Even if it does little to save the planet for humanity, if it helps people in the benighted Congo that is worthwhile in itself. And a much better use of a few dollars than the usual seasonal trinkets and trivia, in my opinion. The 299,645 hectare Mai Ndombe REDD+ project, a former logging concession in the Bandundu Province, will avoid more than 175 million tonnes of CO2 emissions over the 30-year life of the project. The local forest community of 50,000 Congolese villagers will receive direct benefits from the project in the form of jobs, schools, health clinics, improved food security through better agronomy and redevelopment of robust native fish stocks, and capacity building of local NGOs and Community Based Organizations all financed through transparent and equitable sharing of the carbon revenues. “As someone who knows personally the hardships that families in these forest communities have to bear, I am overjoyed at the benefits this REDD+ project will bring, making a brighter future for 50,000 of my friends, family members and compatriots in Mai Ndombe,” said local project Manager Jean-Robert Bwangoy Bankanza. The project area is part of the Congo Basin, the world’s second largest intact rainforest after the Amazon. It is part of the Ngiri-Tumba-Mai Ndombe wetland, recognized under the Ramsar Convention as the largest wetland of international importance in the world. It is home to a wide array of biodiversity including highly endangered forest elephants and bonobo chimpanzees, which have been driven away in increasing numbers due to logging and poaching activities. It is expected that the wildlife populations will be restored now that the project area is on a conservation trajectory. The Mai Ndombe REDD+ project is the world’s largest REDD+ project to achieve validation and verification under the Verified Carbon Standard (VCS), and received Gold Level validation from the Climate, Community and Biodiversity Alliance Standard (CCBA) for exceptional climate change adaptation and biodiversity benefits. According to Jeremy Freund, Wildlife Works’ VP Carbon Development, “This demonstrates that robust VCS methodologies for monitoring, reporting and verification can scale to make REDD+ highly significant to the future of the Congo Basin Rainforest and beyond.” The Joint Venture between ERA and Wildlife Works has both companies cooperating on project finance, technical development, implementation and sales of carbon credits generated from the project. As Canada’s largest and most diversified carbon management solutions company, ERA Carbon Offsets Ltd. helps organizations understand, reduce and offset their climate impact. Its team of industry leaders specializes in the origination, development and commercialization of high-quality carbon offset projects and is proud to also provide clients with a comprehensive offering of sustainability consultancy services. A merger of ERA Carbon Offsets and Offsetters, ERA Carbon Offsets Ltd. is based in Vancouver, Canada and has worked with over 150 of the world’s most prestigious organizations including Aimia, Vancity, lululemon athletica, Catalyst Paper, Harbour Air, HSE – Entega, and Shell Canada Limited. ERA is publicly listed company on the Toronto Venture Exchange (TSX-V:ESR) and in Frankfurt:9EA. For more information, please visit us at www.eraecosystems.com and www.offsetters.ca. The headline comes from the Georgia Straight. A lot of people – including some of the groups most immediately impacted – dismissed the process long before the report was even written. In a 1,448-page report released today (December 17), Wally Oppal writes that the police investigations included a failure to “consider and properly pursue all investigative strategies” and a “general systemic failure to address cross-jurisdictional issues and ineffective co-ordination between police forces and agencies”. The official recommendations include a call for the B.C. government to establish a Greater Vancouver police force. On this blog I have been making this plea for some time – and so have others, including some lo cal police chiefs. The opportunity to get rid of the RCMP seems to have been muffed. But this situation cannot be allowed to continue. On the specific issue of a regional police force, this is an approach I have supported in the past and believe is crucial to improving public safety and policing in the region. I am hopeful that the Province will quickly commit to establishing a Metro Vancouver police force as recommended in the report. 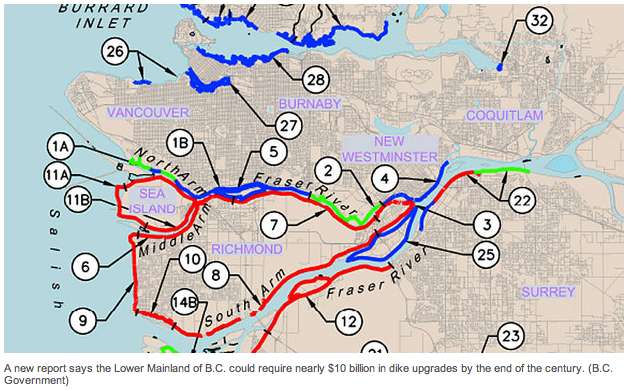 The network of dikes protecting Metro Vancouver will require billions of dollars in upgrades in coming years because of rising sea levels,according to a new report issued by the B.C. government. 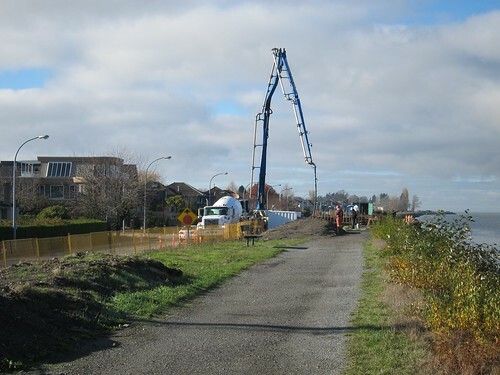 The cost of dike improvements over the next 90 to 100 years could hit $9.5 billion, according to a report released today by the Ministry of Forests, Lands and Natural Resource Operations. Well that was going to be a relief until I read a bit further. It followed a 2011 report which predicted a sea level rise of one metre along B.C.’s coast by the turn of the next century. I have had a new book “High Tide on Main Street” on my reading pile for a while now – since superstorm Sandy raised awareness of things like king tides. But I must admit I feel a bit out of my depth [groan] so I have not really felt able to post a review on it – yet. I am not at all an expert in this area, but for as long as I have lived in Richmond I have wondered about the adequacy of the dyke system – and I have never found the attitudes of the local politicians especially comforting. Complacency has no place in this issue, as far as I am concerned. The Province of BC is going through its public consultation process. As usual, I get the distinct impression that they have already decided on that they think is the correct technical solution to the problem they pose. Nothing much has changed at the Ministry of Transportation which is still operating in “predict and provide” mode. They continue to follow the pattern set by Robert Moses. 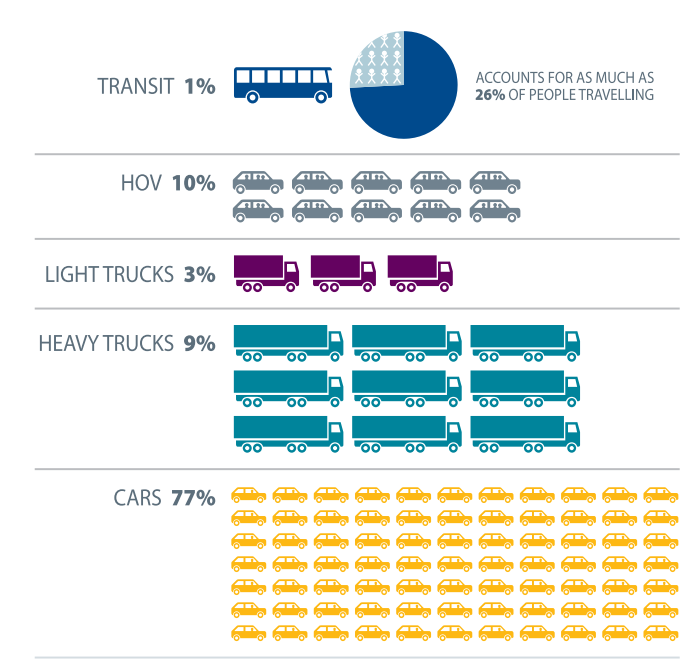 But the whole tenor of the materials (the link above has the entire pdf file) is based on the idea that congestion is getting worse so we must build more space for car traffic. Not that that has ever cured congestion anywhere. I would like to provide a link to that but it came from Gord Price’s blog – there is none there and a search of the Translink document library gave me lots of other stuff but not that quote. So why does it need replacement? 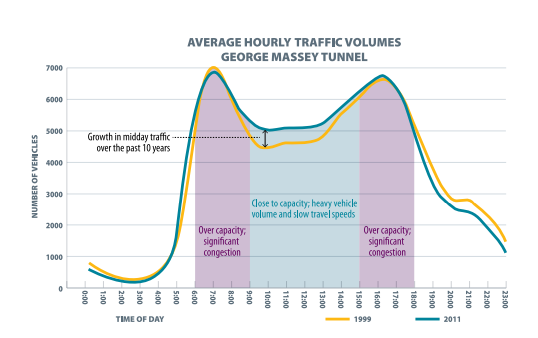 “the tunnel currently has 10 – 15 years of serviceable life before major operating systems will need to be replaced.” So that is not the actual tunnel itself, it refers to the traffic signals, the ventilation system and the drainage pumps. The sort of things that get replaced on a regular basis. “At 22 metres below sea level, the tunnel is … too shallow to accommodate the navigational access needs of increasing ship sizes” Two thoughts about that. First is that sea level rise is going to add 6 feet or more to that before the end of the century – that is if we are better at predicting sea level rise than we have been over predicting the loss of arctic ice. Provided of course that you can persuade Richmond and Delta to raise their dykes enough to keep the water out of the tunnel itself. (see next post) But secondly, the expansion of Roberts Bank is going to provide a lot more berthing capacity for very large ships, without having to worry about squeezing underneath the Alex Fraser Bridge. Given that huge amounts of money are being spent on port expansion there – and the South Fraser Perimeter Road too – why does the Port think it needs yet more large ship capacity – and what happens to the existing deep water berths on the Burrard Inlet (finest natural harbour in the world and all that)? I do NOT think that the predictive capabilities of the Port Authority should actually drive the transportation and land use plans of the region, given their current dismal performance. I did look through the feedback forms, and there is some ability to state that you actually value agricultural land over concrete. But population expansion – and (by implication) more sprawl – seems to be a given. But I would like more ability to state that I do not think the tunnel does need to be replaced, especially when I think that it is likely to be yet another massive cable stayed bridge, with immense ramps on either side that will have to be fitted alongside the existing freeway. There is no illustration of what that would look like. But it either fits behind all the temples along No 5 Road (where the land has not generally been cultivated even though it is ALR) or – more likely – along Sidaway and over the golf course – with a nice big interchange at Blundell to gratify the City of Richmond’s ambitions. Quite how the connections at Steveston Highway might work, my imagination fails. Not an actual commitment, of course. And not a very significant target either. I recall that we were talking about a 17 per cent target for 2010 back in 2004 – because it did not seem like too much of stretch back then. My feedback would be that the tunnel can be made to work more effectively at people moving. And if we really are going to allow more people south of the Fraser then we should get serious about where they will be living and working. Mixed land use might cut the need to travel. “Building complete communities” was what we once called that – not more dormitory suburbs. We could also look at building a transit system with more people moving capacity for the longer term – perhaps electric trains serving the corridor all the way to Seattle, for instance. In the meantime, we simply extend the bus lanes to the south tunnel portal and get them out of the last few hundreds of metres of congestion. And crack down really hard on HOV lane intrusions. We might also think about what the region is going to need as water shortages and rising temperatures in the California desert mean that it will not be the place which we can no longer rely on for our vegetables and fruit. That maybe instead of expanding ports and pretending that importing miners from China is a “jobs plan”, that we adopt a real economic strategy of import replacement and increasing local resilience. Actually I think that is my take home message. Next spring we get to chose a new provincial government. It looks like that could be one that takes a new direction. I have a sinking feeling that the NDP will be just as wedded to conventional economic growth as the BC Liberals – and have nothing really different to offer. But perhaps a few Green MLAs can help them see a better way.